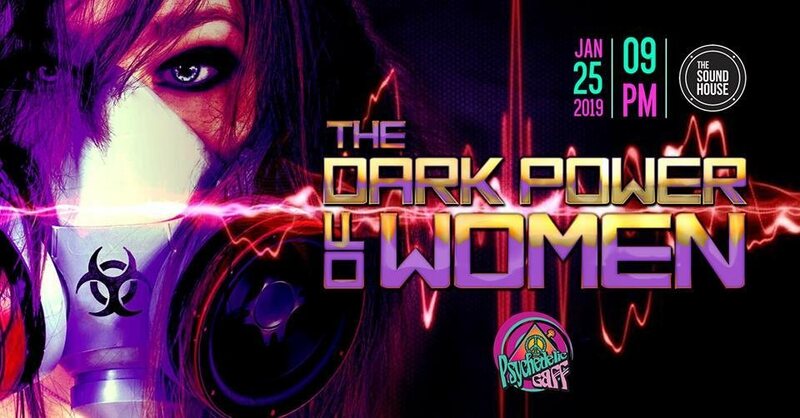 For our first party in 2019 we decided to dedicate to the female power! The Dark Power of Women is coming for its second edition after the success of the first one in 2016. Sarah Naima grew up in an old hippi environment and extraordinary musical family, these love and sensitivity for the music came quite early in her life. Already at the age of 6 she started playing keyboard and since then her passion for music grew steady. In the year 1996 she came in touch with electronic music for the first time. Since then she has been following many different styles in the electronic scene with big enthusiasm until she made the experience of a Psychedelic- Trance Party in the year 2003. The style and the kind of music she chooses for her Sets depends on the atmosphere and energy around but also on the setting and at which time she plays. During the last years Naima grew as an international DJ,and she has performed on various international Parties and some of the best Festivals all around the world like Ozora Festival - Hungary, Hadra Trance Festival - France, Experience - Thailand, Midnightsun Festival - Norway, MoDem Festival - Croatia, Psy FI Festival - Netherlands, Antaris, Freqs of Nature, Waldfrieden,VuuV - Festival - Germany, Blackmoon Festival -Italy, Solstice Festival - Netherlands, Transahara - Marocco, One Love - Switzerland, Kosmos Festival - Finnland, Yaga Gathering - Lithuania, Galaxy Evolution Festival - India, Belantara - Malaysia, Spiritual Ritual Festival- Nepal. Australia, Austria,Brazil, Belgium, Canada,Croatia, Czech Republic, Denmark, Finland,France,Germany, Greece, Hungary, India, Italy,Mexico,Malaysia,Malta,Macedonia,Nepal,UK; Netherlands, Norway, Lithuania Portugal, Poland, Romania, Russia,United Emirates,Spain,Sweden,Switzerland,Slowenia, Slovakia,Thailand, Turkey. Naima is signed as a Label - DJ for Sangoma Records. Estera is involved in underground scene on a molecular level for thousands of years. She fell in love with harmonic mixing which she uses to guide you through myriads of sound in a musical way, creating experience that covers broad frequency spectrum. Estera enjoy bit of headroom and natural dynamics. Her sets are groovy and heavy if necessary and they leave nice after taste. Fernanda D'Avila aka SHAKTI, has become involved with electronic music since 2006 and in a short time she got an interest in showing a psychedelic vision of her own. Noisy Bew is djane, promoter and organizer. Her dedication to deep, dark, progressive and psychedelic music brought her on the founder place of Psylicious - project which main concern is to promote progressive/tech/minimal sounds from the dark side of the moon of psychedelic music blended with visual art. Croatia is her home where she played on festivals and parties, promoting her urge and dedication to progressive sounds. Wright now, Dublin is new step for Noisy Bew and Psylicious where she continues to be involved in developing psytrance scene. Also, Noisy Bew promotes Mo:Dem festival as an ambassador for Ireland. Anunitu comes from the northern forests of Finland and has been part of the psychedelic scene since the Goa parties in the nineties. After years of exploring the sounds of Goa and psy, she started playing at psychedelic parties in 2010 and is a label DJ with Shunyata Records. She is also one of the founding members of the Fluorohive psychedelic collective, organising immersive psychedelic parties on the Emerald Isle. Her main style is deep haunting forest psy, creating energetic journeys, warping minds and twisting the senses, and if the time is right she does on occasion whip out the oldschool Goa records for analogue madness. So join the ride and go wild on the dancefloor.